This post makes number 489. I’m trying to think of something cool for my 500th post, but I’m not sure what to do. 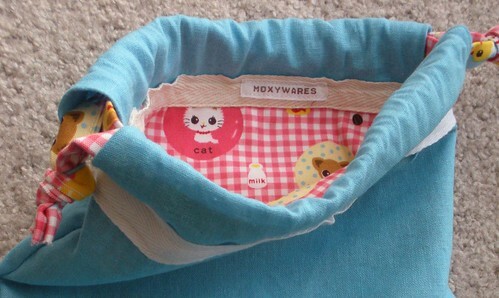 I feel a giveaway is in order – perhaps something with my very fancy new MOXYWARES tag! That was a fun little drawstring bag I made for my niece’s 11th birthday…the blue linen was in the remnant bin at Joann’s! I got about 1.5 yards for like $6. Awesome. But I digress…maybe a box bag for a giveaway? A boxbag with some fun fat quarters inside? In TV news, I’ve been watching all kinds of stuff – good and not so. On the good list: True Blood. Love it. I’m all caught up and can’t wait for the next episode. Also good: Eureka is back on – always good. And a new great show on SyFy – Warehouse 13. Crazy gadgets, funny dialogue, crime-stopping girl/boy duo. In the not-so-good (but I’m habitually watching anyway) category, we’ve got pretty much all of the ABC Family shows. I actually think Secret Life of the American Teenager is pretty good, but I’d like to fire one or two actors and replace them with better ones. I love the little sister, though. I think I saw the best “worst scene” ever on Make It or Break It. I think it was on the 2nd episode. If you, like most people over the age of 15, are not watching this show, it’s loosely based on the film Stick It, which I loved. Elite gymnasts working towards the Olympics, catty teen girl relationships, blah blah blah. So anyway, there was a scene where the gymnasts were at a gas station and these punk guys were coming towards them (with brown bag bottles in their hands) making rude comments. The lead girl says “follow me” and they start cartwheeling and roundoffing towards the bad guys. The guys stumble backwards, saying some crazy stuff like, “whoa, that was some superhero stuff or somethin’!” So silly. I feel everyone must watch this scene. I watched the first episode of 10 Things I Hate About You – another show based on a movie – and thought it was pretty good. The lead girl is great. I’ve been reading some good books also. I just finished Sarah Dessen’s latest, Along For the Ride. Cute YA book. I also finished a Nora Roberts series about witches…Charmed, Entranced, Captivated…I can’t remember the last one. Pretty good. I’m not a full fledged Nora follower yet, but her books are quick, enjoyable reads. Your own label! Too cute.